Odour management at ports brings a breath of fresh air. There’s nothing quite so evocative as a smell: a freshly printed book; a delicious roast meal with all the trimmings; a bunch of hand-picked flowers. However in certain businesses, odour problems can leave a proverbial bad smell lingering in the air unless solved and ports are no exception. However, bad odours can also potentially occur from other sources on board vessels, arising in areas such as sanitary installations, mess-rooms, and kitchens. Ellen Kaasik, head of quality and environmental management at the Port of Tallinn, says that one major issue with respect to odours comes from handling of oil and oil products in the port. Here, the transit of oil products is concentrated mainly in its Muuga Harbour, where the handling of oil products is performed on nine berths. There are three large liquid bulk storage and transhipment terminals: Vopak E.O.S. (storage capacity: 1,026,000 m3), Vesta Terminal Tallinn (405,000 m3) and Oiltanking (78,550 m3). In addition, Neste Eesti (26,000 m3) and Nynas Terminal (14,600 m3) also operate at Muuga Harbour. Ms Kaasik says that strong, odorous emissions can occur during the various handling stages, such as cleaning of railway carriages, loading storage tanks, loading vessels or mixing, heating and homogenisation. Emitted odours may then spread towards nearby communities, annoying the residents. Ports and terminals need to keep on top of the problem from potentially adverse odours from the outside world as well. For example, a tank terminal monitors emissions that come from sources outside the terminal boundaries, which can disperse over the terminal and Port of Amsterdam also keeps a careful eye on nearby oil terminals and other businesses that could possibly emit adverse odours. Ms Kaasik says that in co-operation with the oil terminal operators of the Muuga Harbour, a management system for air pollution monitoring and actions for pollution reduction has been developed. 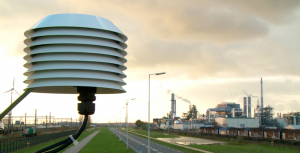 One of the main methods of managing odours is used by a considerable number of worldwide ports including the Ports of Tallinn, Rotterdam, Amsterdam and Sohar. 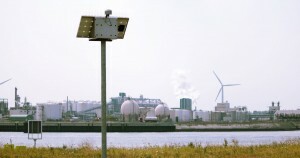 The Electronic Nose (or eNose) is a system that constantly monitors changes in air composition, and around 300 of these have been introduced to do so at ports. Simon Bootsma of Comon Invent BV explains that the core of the eNose is an array of gas sensors. When the gas sensor is powered, oxide radicals are electrically attracted to lattice defects at the surface of the active layer of the device, which can easily detach when reactive airborne molecules approach the active layer: hence, the conductivity of the sensors depends on the interaction of oxide radicals between the surface of the sensor and proximate reactive molecules in the air. Meanwhile, three dozen eNoses have been installed by Comon Invent in the Port of Amsterdam around the North Sea-canal, nearby oil terminals and any other businesses that could potentially release problematic odours. As part of the GeurinZicht project initiated by the port along with EPA North Sea Canal Area and the Province of North-Holland, the aim is to improve the quality of life in and around the area of the port.